January 27, 2019 By Eugene Nielsen & filed under All Articles, Rifles & Carbines, Weapons. POF-USA P415 Edge Pistol takes virtually unstoppable P415 to a new level. Thanks to five-position SB Tactical SBA3 arm brace, P415 can be had in a short-barrel configuration with ease. The wait is finally over. 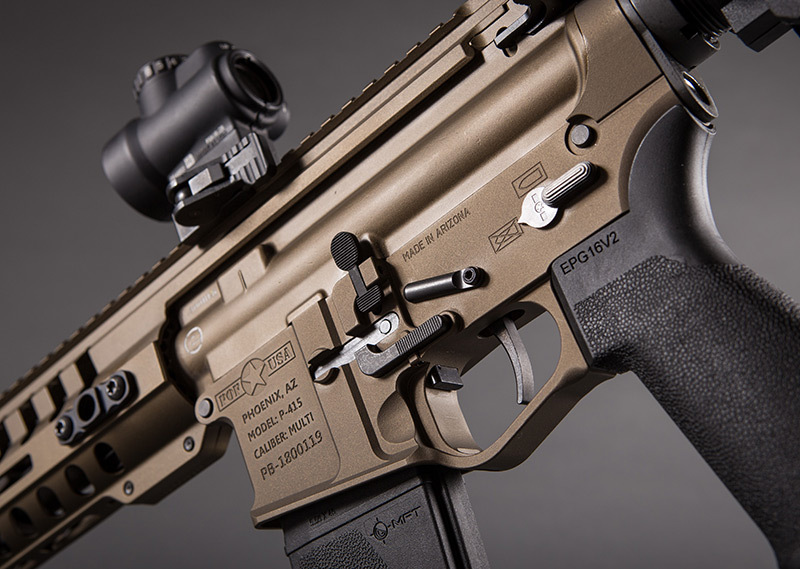 Patriot Ordnance Factory (POF-USA) has entered the AR pistol market, and in a big way. The company is now offering all its models in compact pistol variants. As a result, the company’s Renegade, Renegade+, P415, P308, and award-winning Revolution can now be had in short-barreled configurations with no NFA requirements. AR-15-type pistols were once considered little more than range toys. 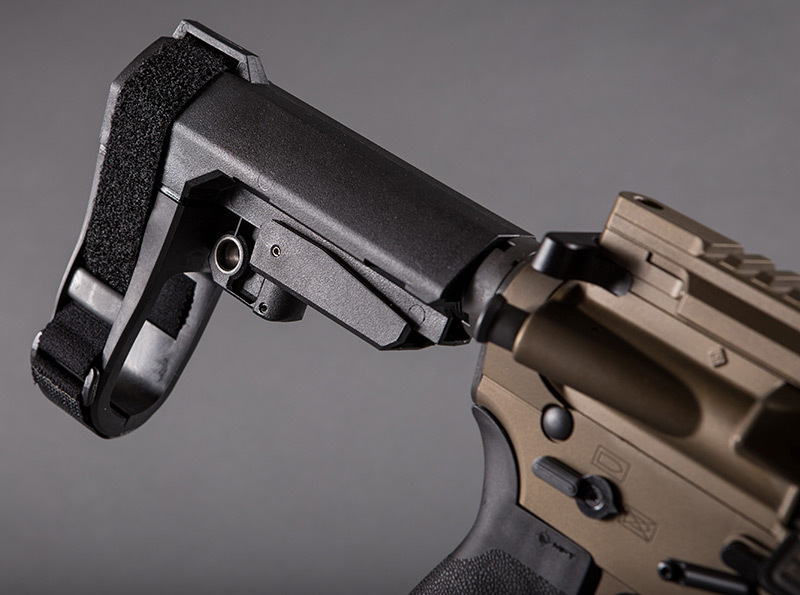 The advent of the pistol brace changed that, blurring the distinction between pistol and rifle and making the AR pistol suitable for serious applications. POF-USA pistols are built to the same exacting cutting-edge standards and specs as their rifles. All pistols feature the new SB Tactical™ SBA3™ five-position adjustable Pistol Stabilizing Brace® that utilizes a milspec carbine buffer tube. As most readers are aware, the “incidental, sporadic or situational ‘use’ of an arm-brace (in its original approved configuration) equipped firearm from a firing position at or near the shoulder” is now perfectly OK with the ATF. Here fully extended, five-position adjustable SBA3 Pistol Stabilizing Brace dramatically enhances versatility of P415 Pistol and provides SBR capability. 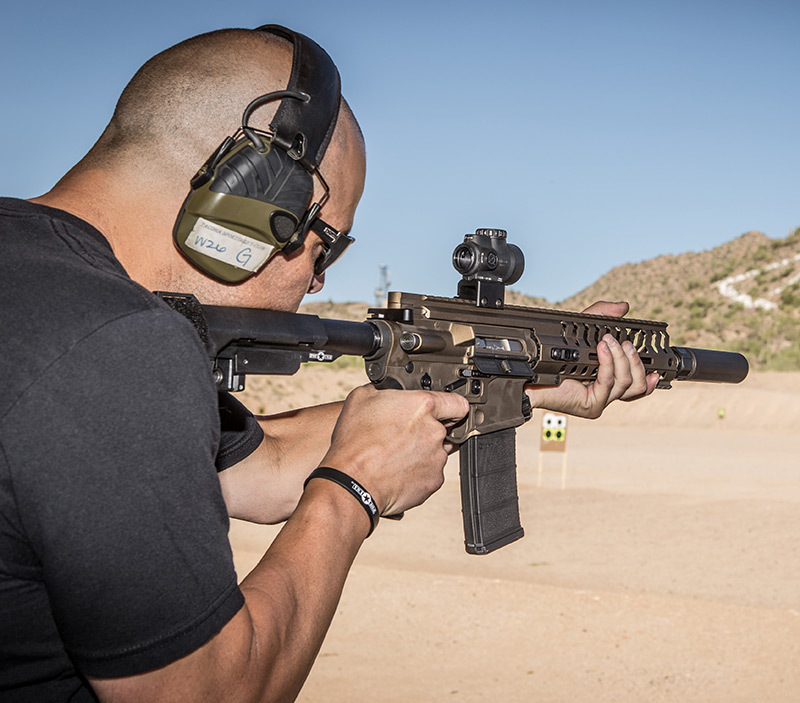 I recently met with Will Milazzo of POF-USA and Josh Locatis of Tap Rack Bang Creative at the Rio Salado Sportsman’s Club in Mesa, Arizona, for some range time with the new P415 Edge pistol. Will also brought along a few other POF-USA firearms to play with, including the prototype of a very cool firearm that’s certain to be a big hit. Alas, my lips must remain sealed for now on the latter. Rest assured S.W.A.T. will be one of the first to review it when it becomes available. The P415 was engineered over a decade ago to be “virtually unstoppable in unfavorable conditions.” It’s a product of POF-USA’s continuous development to the AR platform. A great firearm that I would be willing to trust my life with, its reliability has been proven time and time again under some of the harshest operating conditions imaginable. The P415 is available in both 5.56x45mm NATO and .300 AAC Blackout (.300 BLK). The P415 Pistol provided for evaluation was chambered in .300 BLK. P415 Edge Pistol has proprietary POF-USA match-grade single-stage, non-adjustable drop-in trigger system that boasts a solid 4.5-pound pull weight. It includes custom-fit stainless steel KNS Precision anti-walk pins. The .300 BLK has become a very popular round. It gives options not found in any other factory cartridge for the AR-15/M4 platform. The cartridge was developed to provide improved performance from the AR platform with only a barrel change, using standard bolts. Standard 5.56mm magazines can also be used with the .300 BLK, though I recommend a magazine specifically designed for the cartridge (such as the excellent Magpul® PMAG® 30 AR 300 B GEN 3) for optimal performance with all cartridges. 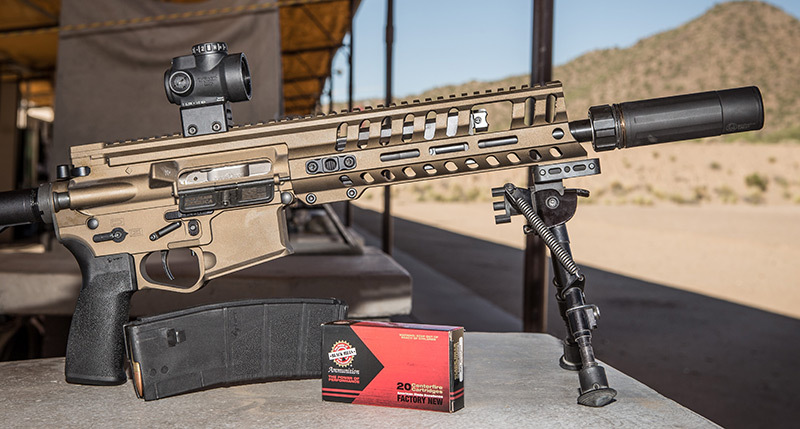 The design parameters of the .300 BLK make it an ideal round for shorter barrels and especially for suppressed applications. Supersonic loads provide ballistic performance close to that of the 7.62x39mm, while subsonic loads vastly outperform the 9x19mm for suppressed applications. Let’s start off with the technical specs of the P415 Edge Pistol: It has all the cutting-edge proprietary features one has come to expect from POF-USA plus some new ones. P415 Edge Pistol is built on POF-USA Gen 4 lower receiver, which incorporates an ambidextrous bolt hold open and release with enhanced bolt catch, ambidextrous safety selector, Teflon® receiver tension screws, over-sized mag well flare, oversized integrated trigger guard with grip relief, and QD sling mount. 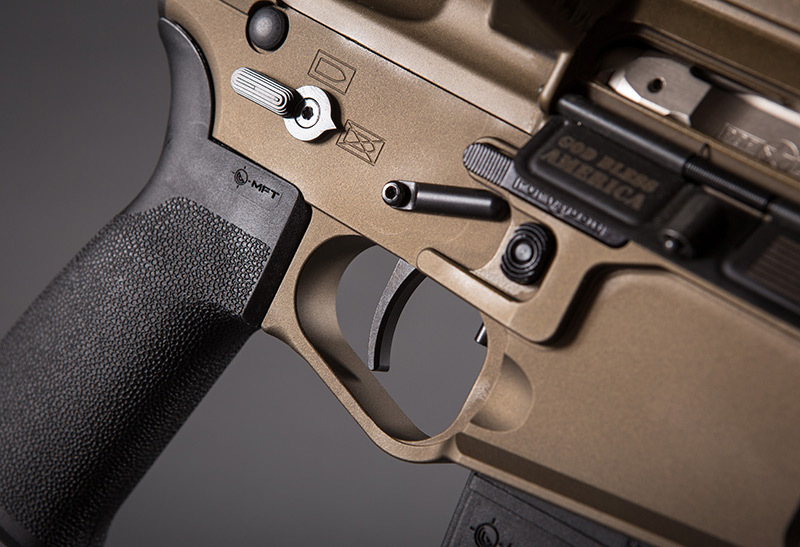 The P415 is built on the POF-USA Gen 4 lower receiver, which incorporates a number of features, including an ambidextrous bolt hold open and release with enhanced bolt catch, ambidextrous safety selector, Teflon® receiver tension screws, oversized mag well flare, ambidextrous magazine release, ambidextrous recessed finger rest, oversized integrated trigger guard with grip relief, and QD sling mount. The bolt carrier is of one-piece design with the bolt carrier key built into the body. The patented design features reduce carrier tilt. The bolt carrier is electroless high-phosphate nickel coated. The bolt carrier group features a chrome-plated bolt, extractor, and firing pin. The finishes provide corrosion resistance and lubricity. POF-USA’s patented E2 dual-extraction system incorporates four small channels built into the chamber to allow a small amount of gas pressure to push against the neck of the spent case as the extractor is pulling to the rear. This assists in extraction by removing a considerable amount of work that would otherwise need to be performed by the extractor alone. As with all POF-USA firearms, the P415 features the company’s proprietary match-grade, single-stage, non-adjustable drop-in trigger. It’s one of the best factory triggers on the market, bar none. The trigger has a 4.5-pound pull with no slack and an exceptionally crisp, clean break and no overtravel. It has a tactile reset. The trigger is pre-assembled in a hard-coat anodized aluminum housing with urethane rubber feet. The trigger, disconnect, and hammer are A2 tool steel and nitride heat treated to 70 RC for strength and corrosion resistance. POF-USA triggers come with KNS Precision stainless steel non-rotating anti-walk pins specifically designed for the company’s ambidextrous lower receivers. P415 Edge Pistol features POF-USA’s patented five-position adjustable Regulated Short-Stroke Gas Piston System, which consists of only three components and is easily adjusted by rotating the gas plug. The P415 features POF-USA’s patented five-position adjustable Regulated Short-Stroke Gas Piston System. It consists of just three major components: the gas plug, gas piston, and operating rod. Instead of gas being directed into the bolt carrier as is the case with a direct impingement (DI) system, in a piston-operated AR, the gas pushes a piston that acts on an operating rod that acts on the bolt carrier, cycling the action. The piston system reduces two problems associated with DI systems: carbon fouling and timing issues (with short-barreled rifles and with the use of suppressors). The POF-USA gas system allows the user to restrict and even cut off the added back pressure when suppressors are employed. That being said, reliable functioning with subsonic ammunition, even with an adjustable gas system, is greatly impacted by both the ammunition and suppressor. For this reason, I chose not to test the P415 Pistol with subsonic ammunition when we were at the range for this article. 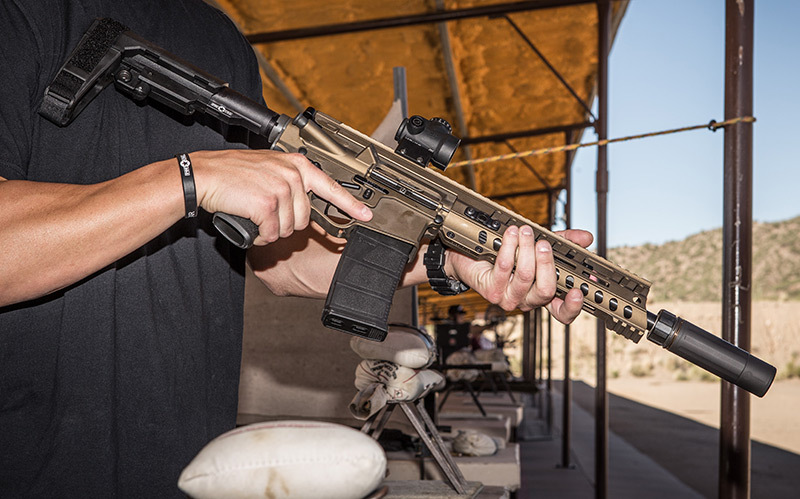 POF-USA offers a free suppressor tune-up for all its firearms. They will install and time the suppressor mounts and tune the gas system to your suppressor and choice of ammunition, including opening up the barrel gas port if necessary, all at no charge. If you will be shooting suppressed, I highly recommend you take advantage of it. Five-position adjustable SBA3 Pistol Stabilizing Brace combines minimalist design with integral ambidextrous QD sling socket. It uses a milspec carbine receiver extension (buffer tube). As mentioned earlier, POF-USA utilizes the SB Tactical SBA3 adjustable Pistol Stabilizing Brace on its pistols. It’s the first (and currently only) ATF-compliant arm-brace to utilize a standard milspec carbine buffer tube. The easy adjustability of the SBA3 greatly enhances its versatility. It features a minimalist design and has an integral QD sling socket. The P415 Edge Pistol has a POF-USA five-position milspec 7075 aluminum receiver extension (buffer tube) that features carrier cradle extensions to ensure the carrier is always supported, even when the bolt carrier is fully forward to prevent carrier tilt and premature wear of the buffer tube. The buffer tube detent is designed to double as a lock that inhibits the buffer tube from rotating and becoming loose. The P415 features a Mission First Tactical Engage AR-15/M16 Pistol Grip Version 2. It has a 15-degree angle that provides improved comfort and control compared to the greater angle of a standard A2 grip, as well as texturing to provide a positive grip surface. The P415 has a 10.5-inch chrome alloy match-grade barrel with either a 1:7 (5.56mm) or 1:8 (.300 BLK) twist, and it is nitride heat-treated for full corrosion resistance. P415 Edge Pistol is equipped with a nitride heat-treated triple-port Dead Air Armament Keymount muzzle brake adapter that’s suppressor ready. It greatly reduces muzzle climb and perceived recoil with minimal concussion compared to traditional muzzle brakes. The pistol is equipped with a nitride heat-treated triple-port Dead Air Armament Keymount muzzle brake adapter to control gas dispersion and reduce muzzle rise. The Keymount brake allows for faster follow-up shots and substantially reduces felt recoil. The Keymount brake is suppressor ready and allows you to quickly attach a Dead Air Sandman-L™, Sandman-S™, or Sandman-K™ suppressor to the pistol. It also fits the Dead Air Key-Mo™ adapter for the SilencerCo® Omega™ and Saker™, so you can use those suppressors as well. POF-USA’s proprietary oversized aluminum heat-sink barrel nut is utilized. It’s over three inches long and completely encompasses the chamber and throat area of the barrel, dissipating heat where expanding gas pressures peak. Multi-caliber rated up to .300 WinMag, 5.4-inch Dead Air Armament Sandman-K QD suppressor adds only 2.9 inches to firearm’s length. The POF-USA heat-sink barrel nut provides 17 times more heat dissipation than a standard AR barrel nut. The long barrel nut also provides more guiding surface for the operating rod to ensure constant positive contact with the bolt carrier. The enhanced backbone receiver also adds substantial increased rigidity to the overall platform. It’s five times thicker than standard flat-top platforms. POF-USA’s patented Modular Railed Receiver (M.R.R.) 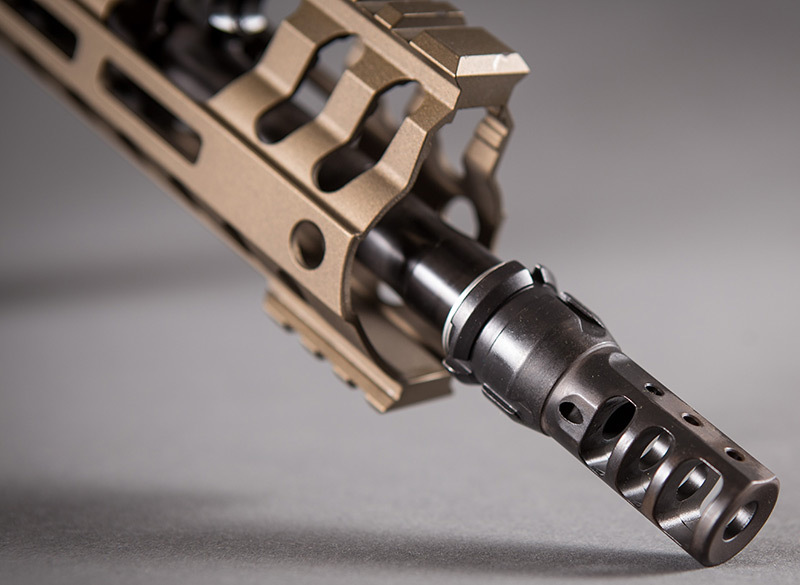 or M-Rail™ provides additional rigidity and precision. It’s a two-piece upper assembly with a free-floating monolithic handguard that slides onto the upper receiver and interfaces directly with it. The free-floating POF-USA handguard keeps any accessories from weighing down on the barrel and reduces stress and flex in the barrel extension area, resulting in increased accuracy. 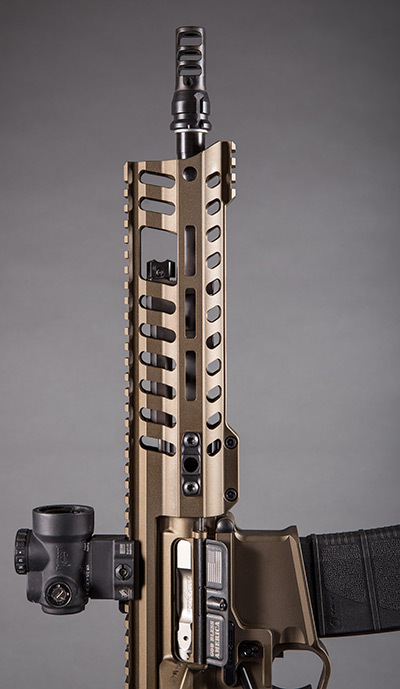 P415 features POF-USA’s newly redesigned Edge rail M-Rail handguard. Size has been reduced from the original by nearly 20%: Width is only 1.75 inches. It features full M-LOK compatibility; front top and bottom section of rail for sights, bipod, or other accessories; and four QD sling mount slots. 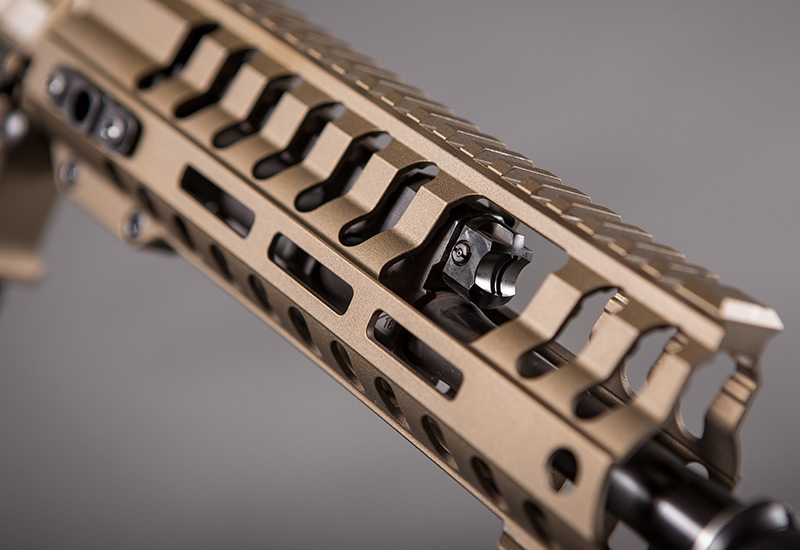 The P415 includes POF-USA’s newly redesigned Edge™ rail handguard. The size has been reduced from the original by nearly 20%, making the width only 1.75 inches. This not only reduces weight but also provides better ergonomics to the shooter. The Edge rail features full M-LOK® compatibility, a front top and bottom section of rail for sights and a bipod or other accessories, and has four QD sling mount slots. The P415 Pistol provided for evaluation was equipped with a Trijicon® MRO® (Miniature Rifle Optic) 1X25mm reflex sight with 2 MOA red dot. Josh brought along a Dead Air Armament Sandman-K suppressor for use in our tests. POF-USA P415 Edge Pistol with Dead Air Armament Sandman-K suppressor. 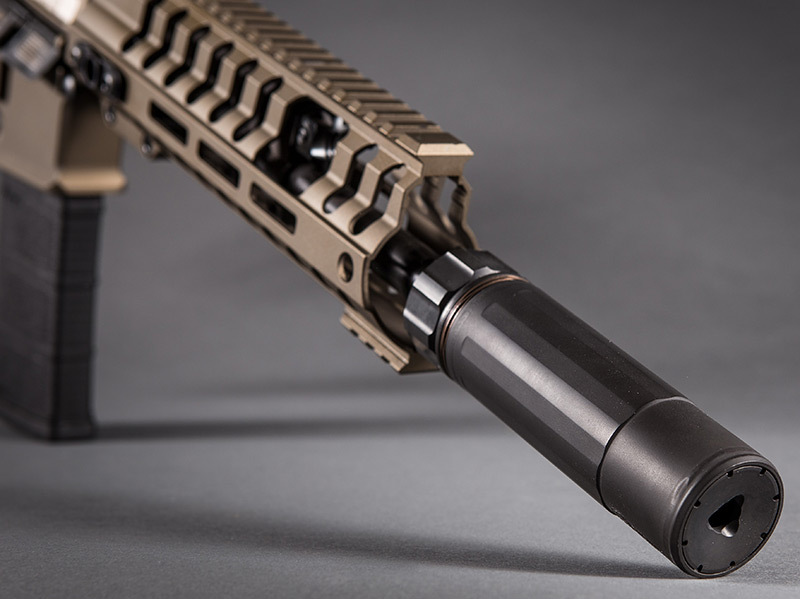 The super-compact Sandman-K is the shortest and lightest of the outstanding Sandman family of suppressors. Designed for CQB, the Sandman-K has an overall length of 5.4 inches and weighs only 12.8 ounces. It adds just 2.9 inches to the overall length of the host firearm. Black Hills Ammunition 300 Whisper®/Blackout 125-grain OTM ammunition was employed for our range testing. Black Hills makes outstanding ammunition. All loads are crafted and hand inspected to ensure the utmost quality and consistency. The P415 Edge Pistol was tested both with and without the suppressor. We did a mix of offhand shooting and bench work off a bipod and a rest. The Dead Air Sandman-K performed admirably for such a compact suppressor. There was some POI shift, as is normal when mounting a suppressor, but it was repeatable and minimal. The P415 piston system made suppressed fire a pleasure, with none of the unpleasant gas blowback to the face that one has with a suppressed DI rifle. Accuracy testing was conducted without the suppressor. The P415 Edge Pistol produced five-shot groups of two inches or less at 100 yards with the Black Hills 125-grain OTM, fired from a bipod with the MRO 2 MOA red dot sight. I have no doubts that POF-USA’s claim of one MOA or better accuracy capability is no bull. There were zero malfunctions with the P415. 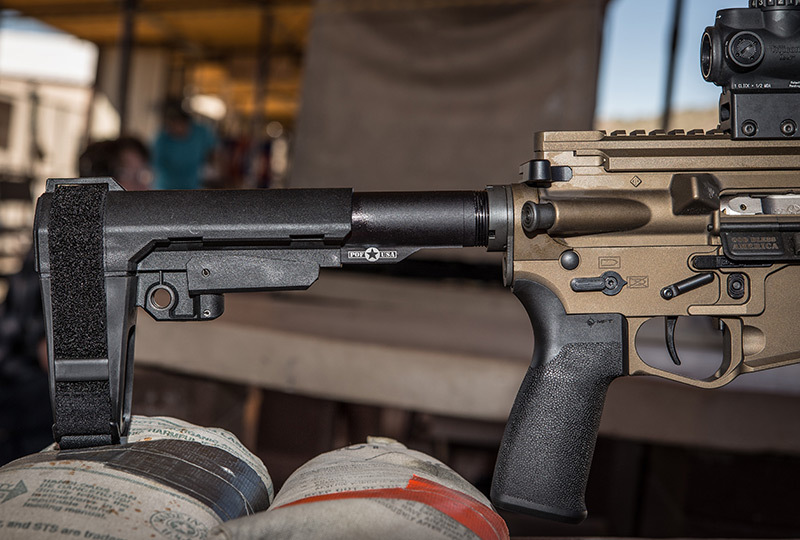 Will Milazzo of POF-USA fires P415 Edge Pistol with Dead Air Armament Sandman-K suppressor at Rio Salado Sportsmans Club in Mesa, Arizona during author’s evaluation. P415 was tested both with and without suppressor. Velocities were measured using a Caldwell Ballistic Precision Chronograph Kit MFG#721122. Temperature was 87 degrees F. Elevation was approximately 1,240 ft. All speeds were measured without a suppressor and in feet-per-second (fps). The Black Hills 125-grain OTM had an average velocity of 2,248 fps with a maximum deviation of 23 fps from the 10.5-inch barrel. For comparison purposes, Black Hills lists a velocity of 2,200 fps with the 125-grain OTM out of a 16-inch barrel. The design, operating system, and muzzle brake on the P415 do an outstanding job of mitigating recoil and muzzle climb. The trade-off with a muzzle brake is increased muzzle blast, but it’s simple to remedy as the P415 Pistol accepts any muzzle device with a 5/8X24 thread with the .300 BLK or 1/2X28 thread with the 5.56mm. Due to its compact size, light weight, and controllability, the P415 Edge Pistol is a fast-handling gun that is a great fighting platform suitable for dynamic urban applications. It’s surprisingly capable for longer range applications as well, thanks in part to the SBA3 Pistol Stabilizing Brace. Compact size and light weight of P415 Pistol make it a fast-handling gun. It’s a great fighting platform suitable for both close quarters and longer range applications. The P415 Edge Pistol is an outstanding firearm for anyone looking for a short-barrel AR. You get POF-USA’s acclaimed quality and performance in a non-NFA platform. Finishes for the 5.56mm model are Black, NP3, Burnt Bronze, and Tungsten color. The .300 BLK model is available in Black and Burnt Bronze. Suggested retail is $1,999.99 to $2,149.99 depending on the finish selected. All POF-USA firearms have a 100% satisfaction guarantee and come with a limited lifetime warranty.